I don't cook much, but this app . . . I don't cook much, but this app . . . is fantastic, not only for cooking & Weight Watchers, but for ALL my unit conversion needs. In the shop at home, as well as at work, where I have to deal with oil field unit systems in metric, imperial or mixed I use this app. It. Is. The. Best! Use it often. Very helpful when cooking! This turned out to be exactly what I wanted and needed. "Try it, you may just like it." This app doesn't have the ability to scale recipes down. It only scales them up. This was the main reason I purchased this app. Asking for a refund. This app is my go to favorite app. 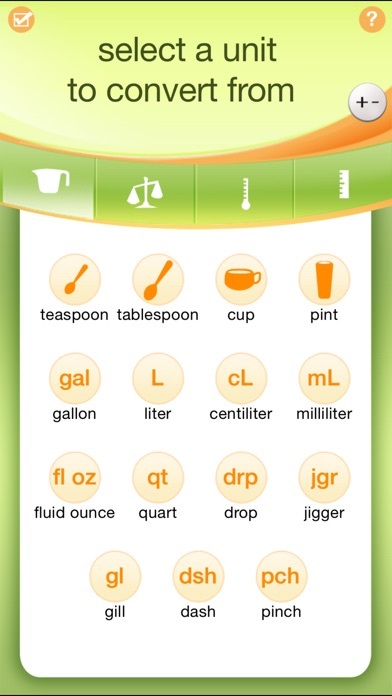 I convert recipes from Volume to weight all the time and I don't think I could do it with out this little app! Keep it the same and if anything add more items to Convert! Deleting this app ASAP! 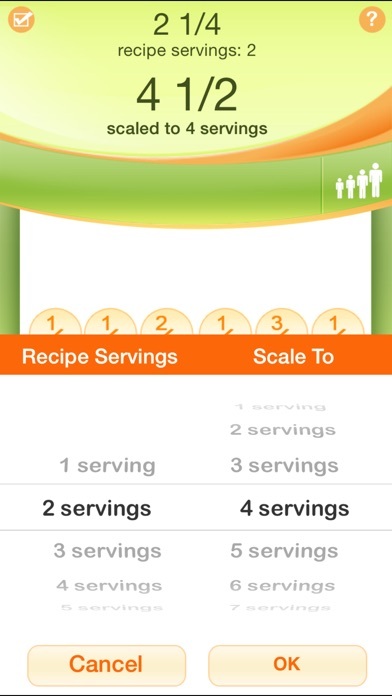 I wanted an app to scale recipes...I found this one totally useless. It is not intuitive. I expected it to give me the new measurements for each ingredient, after entering the number servings and ingredients ...but all it gives is the fraction...I can do that with a regular FREE calculator. Furthermore...eggs are measured as eggs, not cups, teaspoons, or gallons! Very easy to use!!! Quick and intuitive. After making several test measurements I was able to make new entries into the database, chocolate chips, for example. I was also able to tweak entries if I didn't think the existing values were accurate for my conditions. I can only wish for a way to synchronize my changes across all of my devices. I use this app in my ceramics studio all the time, and the kitchen and for the car, etc. Works well every time! This app is indispensable, I use it all the time. Very easy to use and well though out. Very useful, especially in my profession. Thank you!!! Love it, use it all the time. Reliable and accurate. This saves me so much time. I just used it to convert my favorite cake recipe to half the amount and it turned out perfect! The most user-friendly one available! Phenomenal! 1 Cup of Celery is not 8 1/4 lbs! The only improvement I would suggest is to provide the means to repeat a given conversion with different materials. When converting recipe ingredients I have to go back to the beginning and re-specify the same conversion (e.g. cups to grams) over and over again for each ingredient. Other than that, I think it's a great app. This app has been a Godsend for this home cook and canner. A great app for the kitchen, strongly recommend. Very easy to use and intuitive. Surprising number of food items available to convert. I can't run the kitchen without it! And it gives me other equivalent measurements in the office. LOVE this app! I'm a weekend-cook and this app is my go-to-app! Very easy to use when I'm making recipes and recipe conversions in my gluten free baking. Excellent app. I use it all the time. Easy to convert and to move from one type of measurement to another. Highly recommend. Cannot enter a recipe and times it by 10....I can easily convert teaspoons to tablespoons I don't need an app for that. I use this on a weekly basis, at least. I convert recipes often and also use it for many other household uses. Love it! Too cumbersome and confusing, even after reading the help files. Better free apps are available. Accuracy and ease of use makes the app handy in the kitchen. Very handy tool to have at my fingertips. Love it. Truly was a waste of money! Very user unfriendly. Doesn't have a wide list of basic ingredients like Rosemary or minced garlic. Too difficult to figure out! I love this app and have found it useful for many quick conversions. There are dedicated devices for performing more intricate, involved recipe calculations -- and I recommend including some of the suggestions mentioned in some of the other reviews in future releases of this app. For the simple types of calcs I do, this app works wonderfully and I recommend it strongly. Difficult to understand how to operate the app. Unabke to convert small recipes to large recipes. Over 150 portions. Just a really useful tool. I use this all the time for kitchen and other conversions. It's just what I need and not fussy. Not good for conversions. Unable to determine exactly how to use app. No detailed instructions provided. No time to play around trying to figure out how app works. Waste of $3 in my opinion. Everything a novice or professional could ask for. If you're an expert cook, you don't need this. If you're not, it too complicated. 1) Not updated in almost 3 years. 2) it doesn't really handle recipes. It just remembers a constant to use over and over. 3) No meats in the database. Developer may be a vegan, but most people are not. 4) Tells you to go look in the USDA database and add to your database. 5) Too complicated and un-user friendly. Thank you for creating this app has changed my life! Takes a little getting use to but Works perfectly once mastered! Great value. 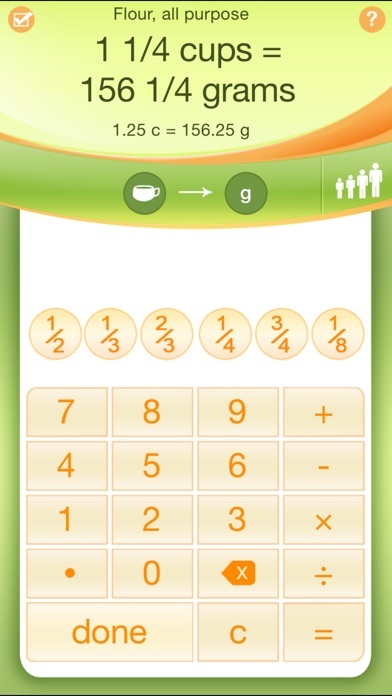 I have found this app to be very helpful in kitchen math, especially when amount conversions are needed. If I had any nag about this app, it rounds off a bit too much in some parts of some conversions, but it usually calcs to 4 decimal places so I'm giving it 4 stars. Worth it; I've already used it 1,000 x.
I've been using this app in formulating products and the ability to educate the app has been invaluable. I use this frequently to convert European recipes. Very easy to use and fairly comprehensive. I'll give it 5 stars when they add ground meat and also ground coffee! I bought this hoping I could enter favorite recipes and scale them up or down and save them. This is strictly for one at a time conversation. Maybe you can save one ingredient, but if there is a way for a whole recipe I couldn't find it after trying 30 minutes. Not intuitive except as a calculator for one item at a time. Super handy and useful, generally accurate , though I think I've had to tweak a couple of measurements. I like that you can add ingredients. Had this app for a decade now. I like to make cured meats and many recipes call for volume measurements , for predicable results it's critical to be more precise. 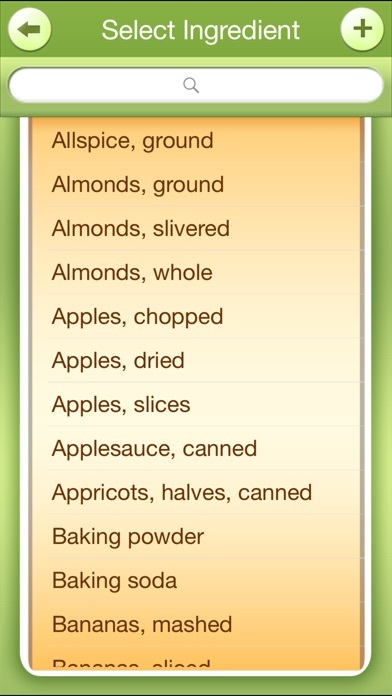 This app helps me convert old recipes and apply modern practices for safer products and less waste. Always opens up and is ready to run. I wish there were more conversions. I love to bake and collect cookbooks. 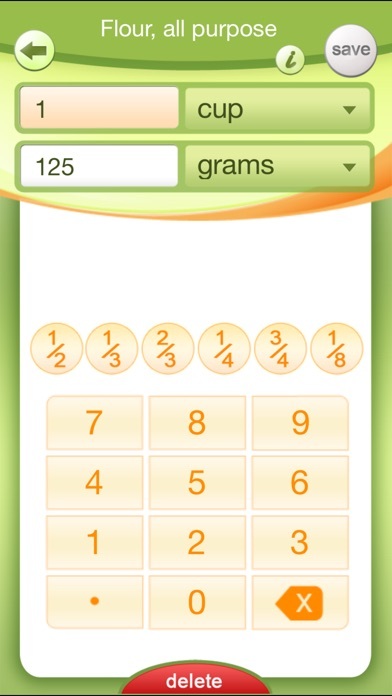 I bought a cookbook in Ireland and all the recipes were measured in grams and I panicked until I found this app. It does all the conversions for you. It's been a life savor. Thanks! Cocino muchas recetas de todo el mundo. Lo necesito siempre y lo uso siempre. I bought a culinary school recipe book . I trying to figure out how to make a pumpkin bread recipe. Recipe book says 2lb/907g. Didn't say how many measure cup. I trying to use calculator. I can't figure it out. I got culinary school book last week. I really want to go culinary school and I want to be a chef. Fantastic app. Makes a transition to a digital scale a breeze. Clean interface; so easy to use.